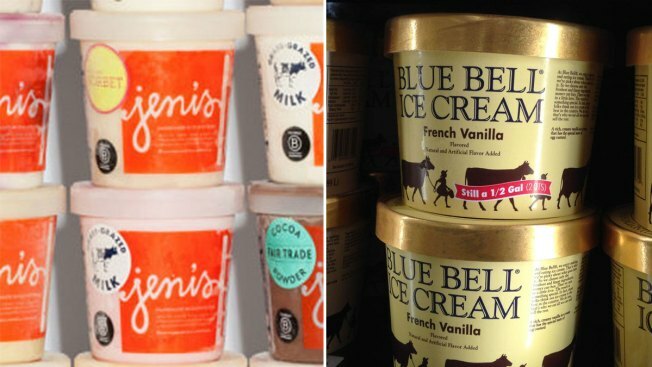 Jeni's Splendid Ice Creams of Ohio, left, and Blue Bell Creameries of Texas have voluntarily recalled their products after the discovery of listeria bacteria. Jeni's Splendid Ice Creams has found listeria in its plant again and has halted production and closed retail shops for the second time since April, the company said Friday. Listeria was discovered during routine swabbing that is part of the monitoring process, and the Columbus-based company is taking steps to figure out how it got into the plant, CEO John Lowe said in a statement on the company's website. "We have a theory and are testing that theory," he said. He said safety protocols worked as intended, and no ice cream was contaminated. There is no timetable for resuming production, Lowe said. Jeni's is temporarily closing its 21 retail shops because there isn't enough ice cream to keep them stocked. The statement didn't provide specifics about where the listeria was discovered, and the company said it wouldn't comment further. Jeni's shut down production April 23, recalled its products and closed shops after listeria was discovered in pints of ice cream and the plant. The company had traced the source to a pint-filling machine in the plant. Jeni's destroyed $2.5 million worth of ice cream, then cleaned and reworked production to try to prevent future contamination. Production resumed May 13, and shops reopened May 22. There were no known illnesses from Jeni's April recall, which came as Texas-based Blue Bell Creameries also shut down and recalled all products after listeria in its products was linked to three deaths. A government investigation of Jeni's found inadequate testing and cleaning in its plant. The report said Jeni's managers did not have an adequate sampling and testing program and were not sufficiently sanitizing some surfaces, including the floors. Once inside a plant, listeria can be very difficult to get rid of. It is found in soil and water and can be tracked into a facility by employees or carried by animals. Listeria illnesses generally only affect the elderly, people with compromised immune systems and pregnant women.